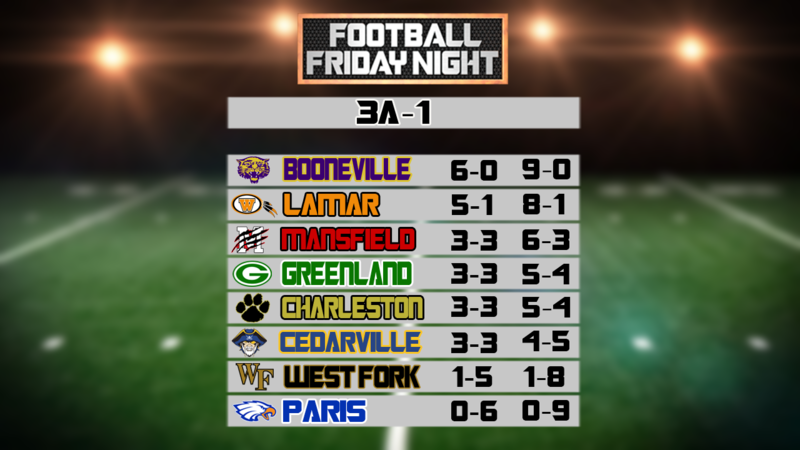 Things can’t be any more simple for the 7A-West’s top two spots. The Tigers and Wolverines will meet in week 10 with the winner taking the conference title for the second straight season. The loser will be the number two seed. Fayetteville controls their own destiny when it comes the No. 3 seed in the 7A-West as if they beat Har-Ber, the Purple Dogs get the slot. A Har-Ber win could throw a wrench into the process and brings the possibility of a three-way tie with Springdale into the equation. The Red Dogs are at Van Buren in week 10. If all three finish 4-3 in league play, the tie breaker points would come into play. Those points are currently: Fayetteville (52), Har-Ber (39), Springdale (24). Much like the battle for the No. 3 seed, nothing is set for the No. 4 seed. Should Fayetteville beat Har-Ber, then the Wildcats could slide all the way to No. 5 as they lost to Springdale earlier this season. Van Buren is still in the mix and could move out of the No. 6 seed with a win over the Red Dogs. Playoff points could come into play. 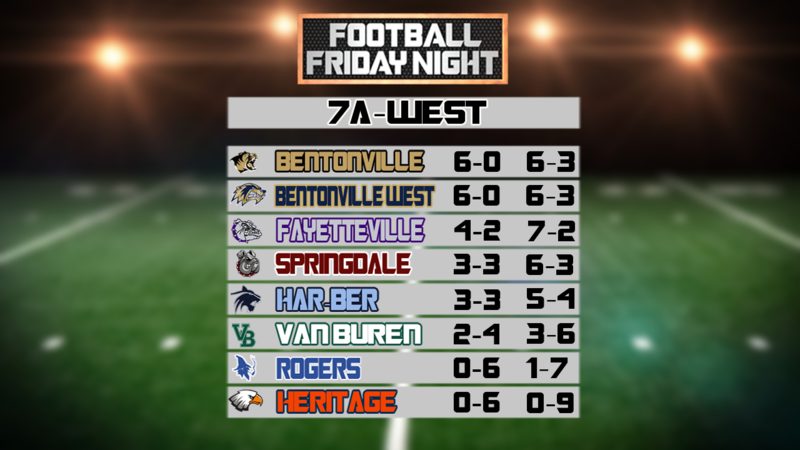 Those points are currently: Fayetteville (52), Har-Ber (39), Springdale (24), Van Buren (23). The Charging Wildcats locked up the conference title by rallying back from a 21-0 deficit against Bryant in week nine. Defending champs have now won 26 straight regular season games. Both lost to NLR and square off in week 10. The winner gets the No. 2 seed and would be on the opposite side of the playoff bracket than the Charging Wildcats. The loser in the No. 3 seed and could face NLR in the semifinals. It looked like it was going to be Northside vs Southside for the No. 4 and No. 5 seeds but a Grizzlies’ stumble at Cabot in week nine has chaos in the future. The Mavericks travel across town to face Northside in week 10. 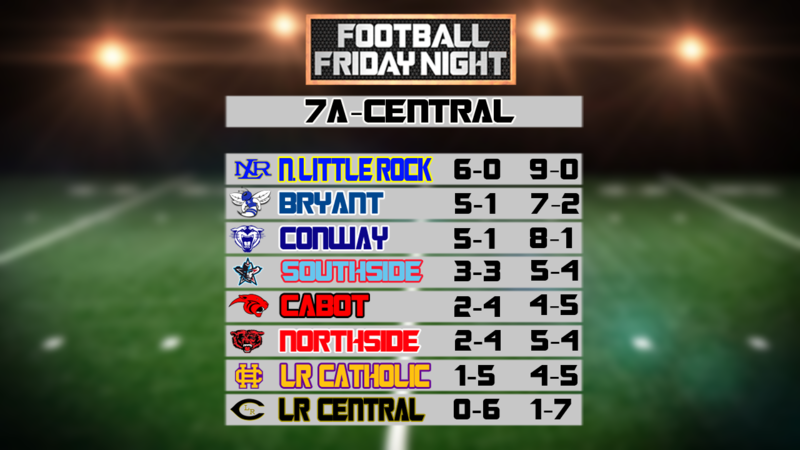 Cabot ends the regular season at top ranked North Little Rock while Catholic faces the lone winless team in the conference, LR Central. A Southside win and they are the No. 4 seed. Playoff points could come into play. Those points are currently: Southside (27), Northside (26), Cabot (25), Catholic (2). The Bulldogs wrapped up the top spot with a rout of Sheridan in week nine. They gunned down Benton in week eight to essentially win the league. Defending champs look like the favorite again. Panthers can’t be caught for the No. 2 seed as they own the head-to-head tie-breaker with Russellville. Russellville is at Siloam Springs in week 10 and a win would give the Cyclones the No. 3 seed as they are the only 4-2 team in the conference. Siloam and El Dorado are both 3-3. A Siloam win would bring the tie-breaker points into the equation as El Dorado faces last place LR Hall. 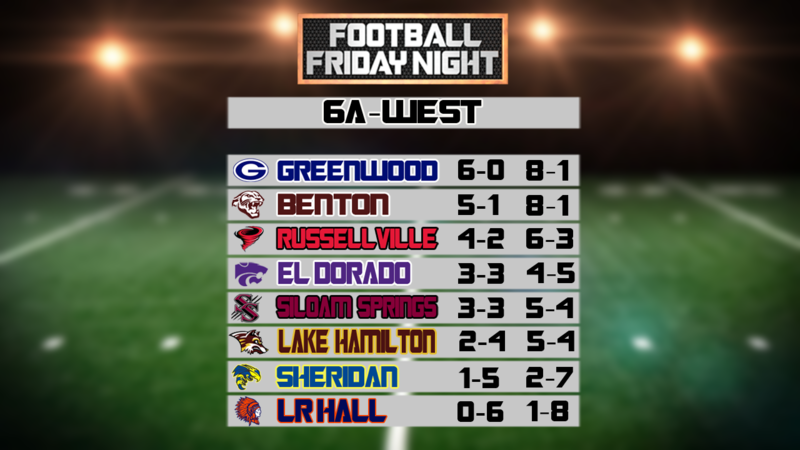 Those points are currently: Russellville (41), Siloam Springs (30), El Dorado (29). Much like the race for the No. 5 seed, not much is clear about the final playoff spot. The three teams mentioned are in the playoffs barring a huge Sheridan upset of Benton. Playoff points could be the deciding factor. Lake Hamilton has 26 tie-breaker points. The Goblins are in control of the league as every other team has at least two losses. Alma could have all but secured the No. 2 seed in week nine but a 24-21 loss ta Greenbrier threw a wrench into the system. Alma Greenbrier and Morrilton are all tied at 4-2 while Vilonia is 3-3. Greenbrier hosts Vilonia in week 10 and is in the playoffs with a win. 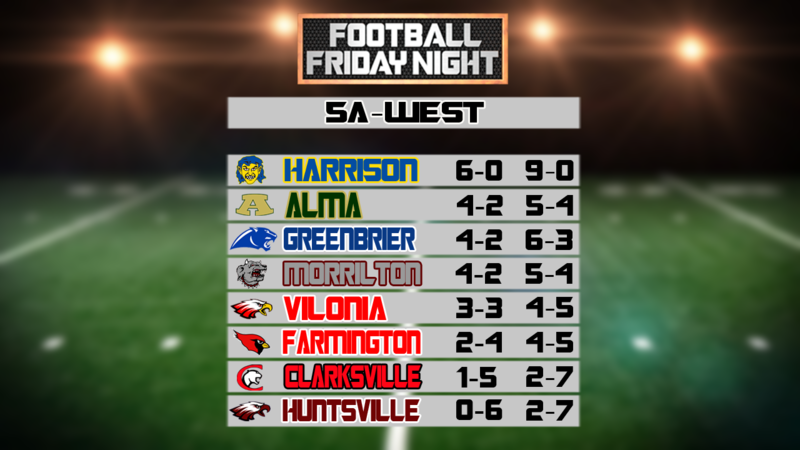 Alma travels to Huntsville while Morrilton is at Clarksville. Tie breaker points could be a factor. 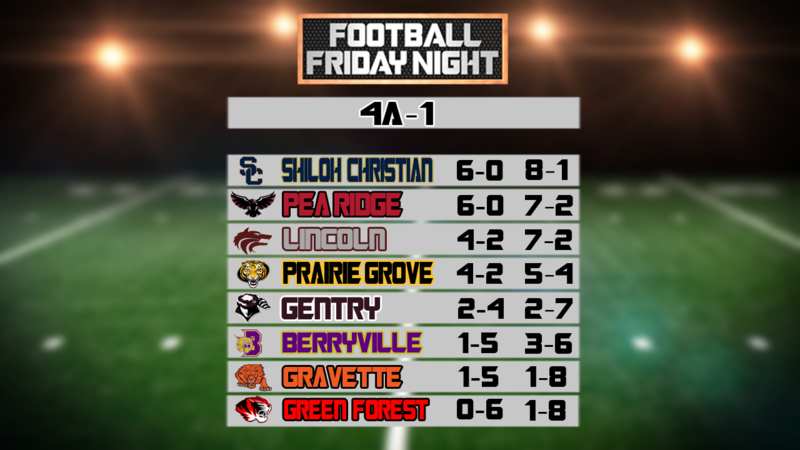 Those points are currently: Morrilton (46), Greenbrier (42), Alma (34), Vilonia (29). They meet in week 10 win the conference title and the No. 1 seed on the line. Both are a perfect 6-0 in the league. They meet in week 10 with the winner getting the No. 3 seed while the loser will be the No. 4 seed. Both own wins over Gentry and Gravette to settle any tie-breaker for the No. 5 seed. Gentry is at Gravette and is in the playoffs with a win. Gravette needs a win and a Berryville loss to get into the postseason. Should the Lions and Bobcats both win in week 10, then the tie-breaker points would be used to settle a three way tie. Those points are currently: Gentry (26), Gravette (13), Berryville (13). The Hillbillies have already locked up at least a share of the league tile and the No. 1 seed as they own the head-to-head tie breaker with Dardanelle. Dardanelle faces Mena in week 10 and would be the No. 2 seed with a win. 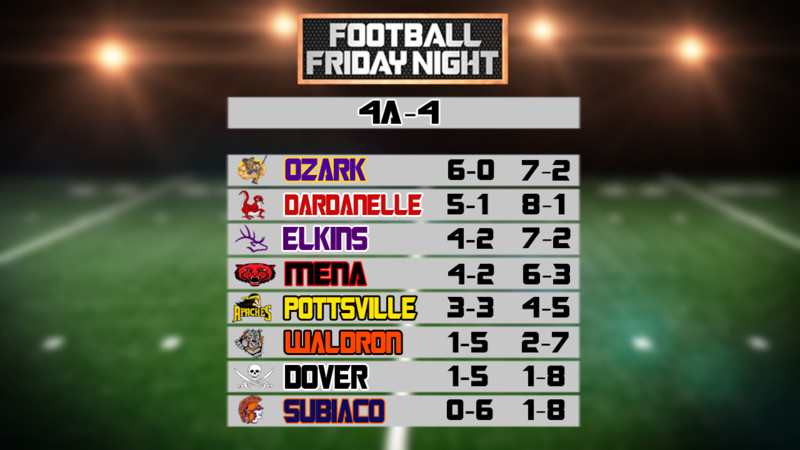 Elkins is hoping for a win over Ozark and a Mena win to force a three way tie but the Elks lost to both the Bearcats and Sand Lizards. Playoff points could come into play. Those points are currently: Dardanelle (65), Elkins (52), Mena (43). Things get a little complicated here. Pottsville will likely finish the conference slate 4-3 as they face Subiaco Academy in week 10. A Mena win vs Dardanelle would ensure Pottsville the No. 5 seed but there are scenarios in which there could be a three-way tie. Pottsville is 3-3 while the Elks and Bearcats are 4-2. Those points are currently: Elkins (52), Mena (43), Pottsville (39). Bearcats clinched the top spot and their 34th conference title with a 28-7 win over Lamar in week 9. The Warriors are the only one loss team in the conference and will get the No. 2 seed despite the result of their week 10 contest vs Charleston. Mountainburg is in the driver’s seat as they are they only unbeaten team in conference play. A win and the Dragons are the No. 1 seed as they travel to Hector in week 10. A Hector would give them the top seed while the Dragons can fall no farther than the No. 2 seed. A Hector loss and a Magazine win in week 10 would give the Rattlers the No. 2 seed as they own the head-to-head tie-breaker. Mountainburg owns the tie-break with Magazine. Hector or Magazine can fall no farther than the No. 3 seed. The Hornets got a huge win, 22-0, at Lavaca in week nine to not only put themselves back in the playoff picture but likely in the No. 4 seed. 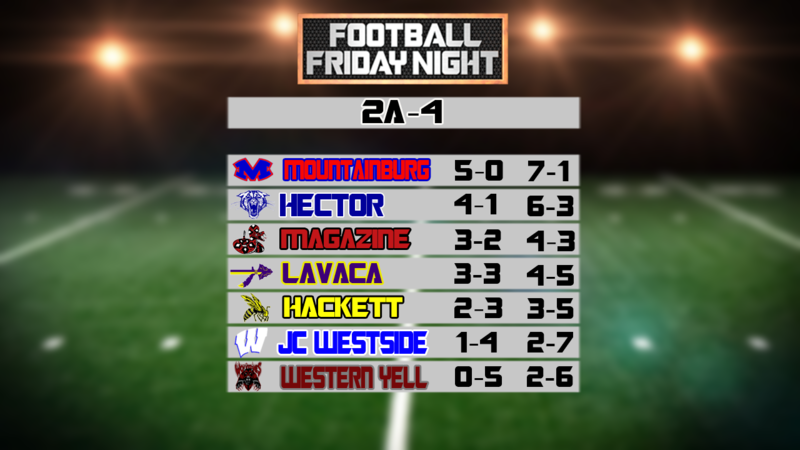 Hackett needs a win vs Western Yell Co. to lock up that spot. Lavaca would be the No. 4 seed with a Hackett loss or the No. 5 with a Hornets win. The Arrows face the Lamar JV squad on Thursday night.